When you wanted to start diving, it was easy – you just enrolled yourself to a diving course. Now, having a diving license, you have more opportunities. What you can choose from are diving packages and different advanced and specialty courses, during which you can expand your knowledge and develop abilities. Nautica Hvar Diving Center organizes diving every day. In the mornings our boat goes for 2-dives trips, which last for about 5 hours. During such a trip you dive in a group of certified divers, visiting each day two different dive sites (each dive lasts for about 45-50 minutes). Don’t like getting up early? Don’t worry, there are also trips in the afternoons 🙂 So you can dive in the morning or (maybe and?) in the afternoon. Not enough? Don’t worry – usually twice a week we organize night dives. 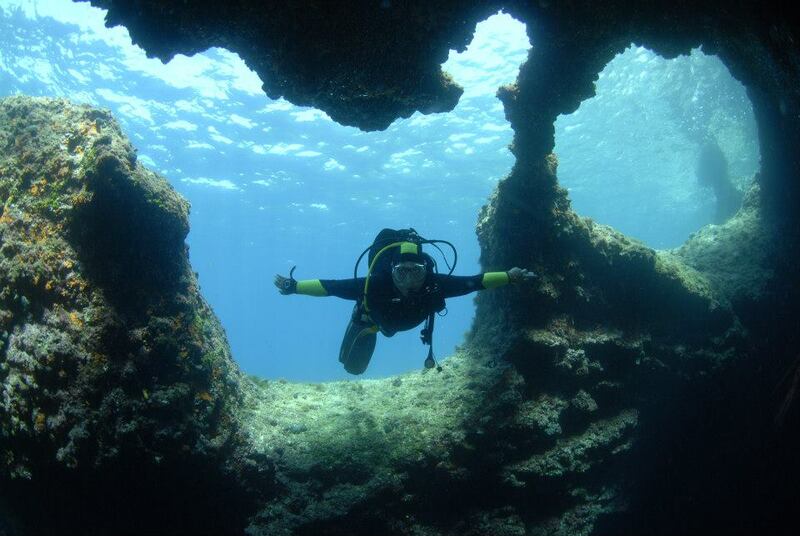 Summing up, during one week holidays you can do over 20 dives! But honestly, Hvar has a bit more to offer than the underwater world only, and that’s why the majority of our guests choose 10-dives packages. Anyway, there are over 20 dives sites we regularly visit. The majority of them is located next to the Hvar island, but we also visit some spots of the island of Brač and Campanella – an underwater mountain on the way from Hvar to Vis. If you want to know more about particular dive sites, click here. The diving trips can be totally relaxing – just enter the boat, prepare your equipment, drink a cold juice, get some rest in the sun, eat biscuits and go diving. Diving trips can be also joined by the nondivers for sunbathing, swimming and snorkelling. Want more? You can always make use of holidays to learn something new. All the diving packages might be combined with advanced and specialty courses, which you can read about below. The Advanced Open Water Diver course is dedicated to Open Water Divers, who want to expand their knowledge and develop diving abilities through various adventure dives. The course consists of 5 dives of different specialties and lasts for 2-3 days. What might be important, the course is less time-consuming than OWD course, and usually the theoretical sessions last for an hour or two per day. After completing the course the divers get licensed to dive to the maximum depth of 30 m. The AOWD course can be also undertaken by Junior Open Water Divers who are at least 12 years old – Junior Advanced Open Water Divers are able to dive to 21 m.
There are various specialty courses that can be taken during the stay at Nautica Hvar Diving Center. Some of them are available to open water divers, some require at least advanced licenses. Some courses can be joined by the junior divers, some are available to people over 15 years old only. Although the specialty courses are different, what they have in common is the joy they bring to the participants. Specialty courses consist of 2-4 dives and last for 1-2 days. Besides the adventure dives, there is always a theoretical part, which lasts for few hours. The specialty courses might be chosen from the variety of PADI and SSI courses lists. Frequently chosen courses are briefly described below. The aim of perfect buoyancy course is to increase the buoyancy control, minimize gas consumption and learn how to move more efficiently above the bottom. This course is dedicated to anyone who wants to feel more comfortable under the water no matter on diving experience (Junior Open Water Diver certification is required to enroll in the course). Many divers say that night diving is their favourite. Night dives are usually shallower and longer than day dives and are dedicated to marine life observation. Some of the most amazing animals, like hermit crabs and octopuses, are active during nights only. Nevertheless, diving in the dark or limited visibility might be stressful, so it’s worth to learn how to enter and exit the water at night and how to communicate using a torch to be able to focus on the beauty of the sealife. 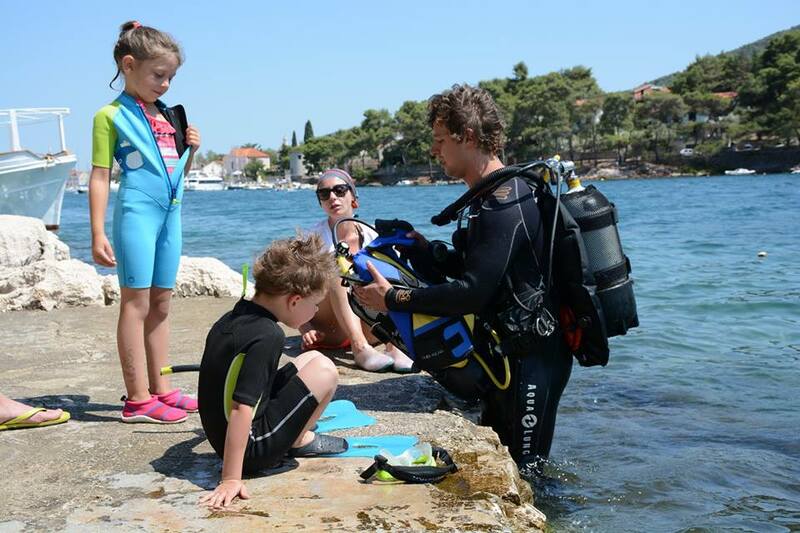 Deep diving course enables you to dive to the maximum depth of 40 m, what gives the opportunity to see the majority of sites around the island of Hvar and find out that well-known yellow sponges are fluorescent at great depths. During the course you will learn how to manage your gas supply, how to plan a deep dive and you will develop the buoyancy control abilities. Do you feel cold under the water from time to time? Don’t worry, you don’t have to resign from diving, you can even extend your diving season. Just change your equipment and start using dry suit. Good news is that you don’t have to buy a dry suit to start a course – you can try one of our No Gravity Traveler suits. Once you realize that it’s not the air consumption but the no-decompression time, what makes you shorten the stay at the depth, you should take an enriched air diving course. 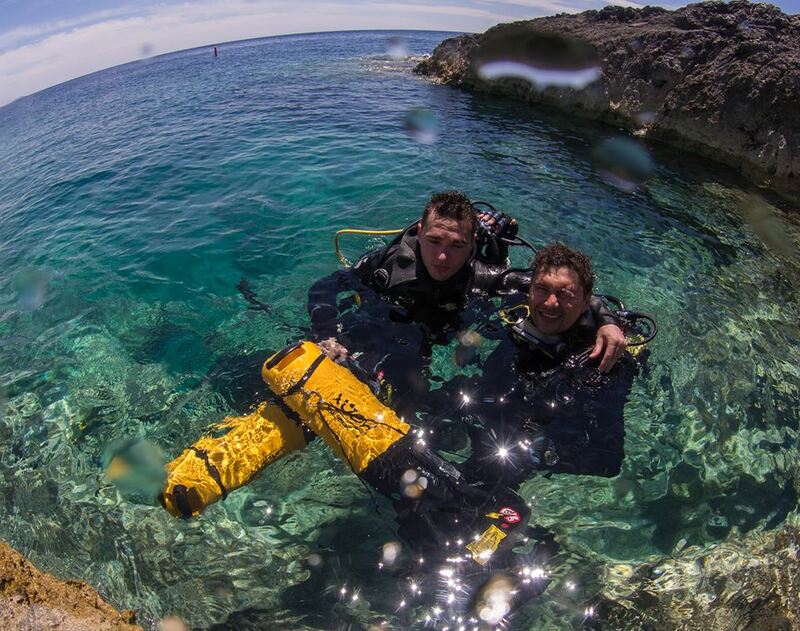 After completing this course you will be certified to dive with nitrox mixtures of up to 40% oxygen and you will discover the benefits during the next repetitive dive. If you like taking pictures, you should consider becoming an underwater photographer and test one of our Olympus cameras. The underwater photography differs a bit from this you know from the everyday reality. There are special tricks, but if you already know some of them, you should also think about participating in weekly photography workshops, which are organized a few times a year. During some dives, it’s good to slow down and almost not to move. During the others, the ability of fast swimming seems to be necessary. It occurs especially when there are strong currents or long distances to pass. What to do to swim fast and not to get tired? Use a diver propulsion vehicle. And you will realize that you want to have it always with you, as you will redefine the word fun. The basic open water diver certification ables you to dive with a buddy only, unless the local law provides otherwise. Diving more and more often, gaining experience, once you realize that you feel that comfortable, that you don’t need a divemaster or instructor with you under the water. And diving with friends you may also find out, that you are the most experience among them. Sounds familiar? Answer yourself a question, if you will be able to help anyone in case of any diving accident. Think about it, that your less experienced friends might expect, that you will know what to do. If you aren’t sure, than it means that it’s the right moment to take a rescue diver course to increase safety under the water. The aim of the rescue diver course is to teach you how to help yourself and others, when needed. The course lasts for about 4 days and it’s quite challenging, but gives tons of satisfaction. You will learn a lot about the medical issues of diving, about the emergency management and equipment. To take this course you have to prove that you completed first aid and CPR course within the latest two years. Didn’t you? Don’t worry, it might be an additional part of your rescue diver training, giving separate certification. Besides the theory, there are a few confided water sessions during which you will learn how to cope with the emergency situations. You will learn how to recognize and deal with stress and how to help someone at the depth not harming yourself. You will also get some physical training and will get acquainted with the techniques of swimming while towing someone. The last part of the course is a realization of a rescue scenario, in which usually the whole staff of the diving center is involved, pretending victims of diving accidents, including panicked and unresponsive divers. The Divemaster course is dedicated to people who want to work in the diving industry. It is the first professional certification after which it is easy to become a diving instructor. The main role of the Divemaster is organizing and leading recreational dives, supervising the groups of scuba divers. If you are an experienced scuba diver, who wants to expand his knowledge and abilities and try something new, but the list of specialties is too short for you, first answer yourself a question, where do you see yourself in a few years. If you dream about seeing a wreck at the depth of 100 m, enroll yourself in technical diving courses. If your aim is to spend a year abroad and show people the beauty of the underwater world, you are in the right place. You – a candidate for Divemaster. The Divemaster course lasts for at least two weeks. During this course you will expand your knowledge to be able to teach the beginners. You will also develop your diving skills to perform them on the master’s level. Once you finish the course, less experienced divers will look at you as if you were a model, an example of perfection in diving. As a certified Divemaster you will be leading dives, assist the instructors during courses and conduct a few diving programmes. That’s why during the course you will need to learn how to do a good, appropriate diving briefing. As you can imagine a briefing for a scuba review programme differs from the one you provide before a recreational dive. During the second one, it is important to be able to tell the divers about the diving site. Sometimes you will also have to draw a scheme of the site and that’s why mapping an open water site is an important part of the course. During the course you will learn a lot, but many divers say that two weeks are not enough to practice new skills. That’s why the Divemaster course is often combined with the internship in the diving center. Please contact us, if you want to get more information about the internships.